Apple recently gifted every iTunes user a free copy of U2’s new album. While most people enjoy getting free stuff, not everyone (especially given that there are more than 800 million iTunes users) likes the band U2. 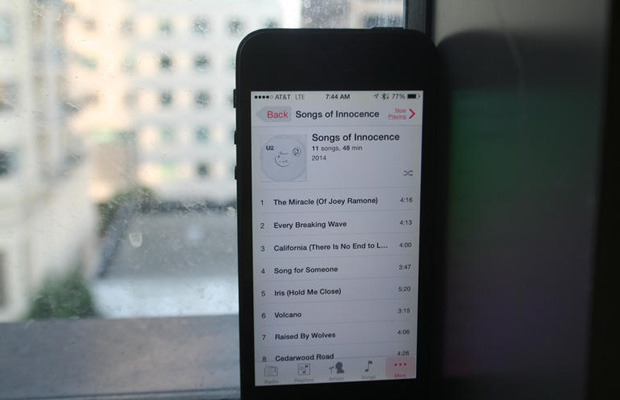 You will find the album, “Songs of Innocence,” in the purchases section of iTunes. 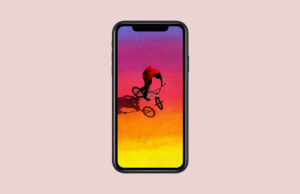 Some users may have also noticed that it was automatically downloaded to their computer and iOS device. 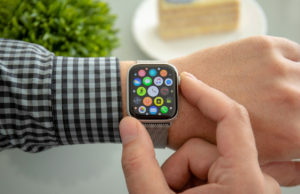 This only occurred if you had it configured for your iTunes to automatically download purchased content to your iPhone, iPad, iPod Touch, or computer. 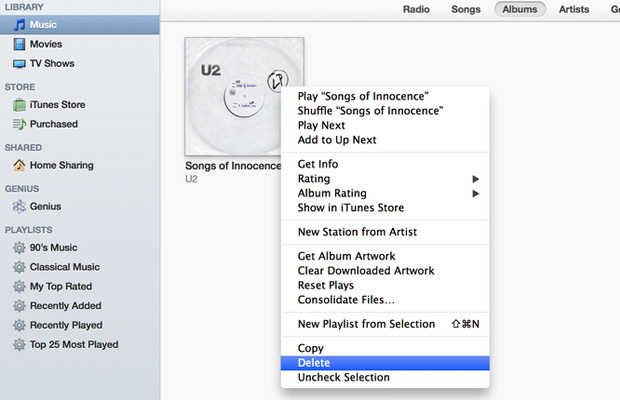 If the album automatically downloaded to your iTunes library, simply open iTunes, go to your music library, click on the Albums tab at the top, right-click the “Songs of Innocence” album, and select Delete. If you would like to stop purchases from automatically downloaded to your library, open the iTunes preferences, click on the Store tab, and uncheck the automatic downloads box. As mentioned above, you will find the album in the purchases section of iTunes. To hide the album from appearing with your other purchases, go to the iTunes Store and click on the “Purchased” folder under the “Quick Links” section on the right. Hover over the album, click the X in the upper left, and confirm the action by clicking Hide. To unhide the album, go to your iTunes store account and click on the “Manage” button under the iTunes in the Cloud section. If there is a cloud icon with a down arrow next to the songs, then they aren’t actually on your device and thus for aren’t taking up space. It simply means that the songs are located “in the cloud,” and are available for downloaded to your device. 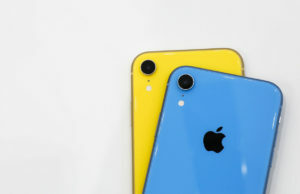 If you don’t see a cloud icon, and you’ve accidentally (or otherwise) downloaded the album to your iPhone, iPad, or iPod Touch, you can still delete it from your device. Open the Music app, click on the album, and individually swipe left over the songs to delete them. From your device, you can’t permanently remove an album stored in the cloud, you can hide it from the iOS Music app. 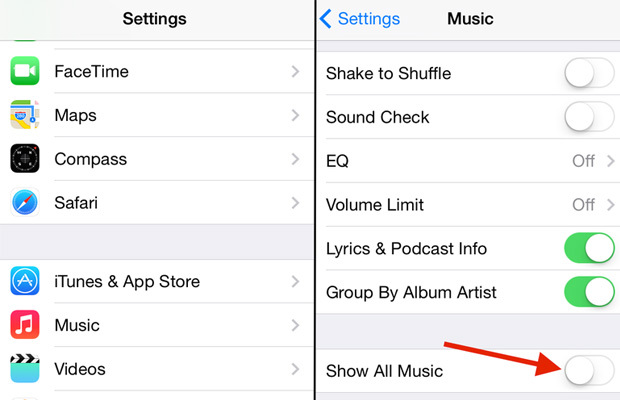 This can be done by going to Settings, clicking on Music, and toggling the “Show All Music” switch to off. The Music app will now only display music you have downloaded to your device, and you won’t be able to download or stream music stored in iTunes in the cloud. If you are an iTunes Match user, however, know that toggling this switch off will also hide all of your matched songs. Even though it’s not on your device, when the album is available for download from the could, it will still be played in Shuffle mode — meaning you’re stuck with the U2 album through October 13, or until Apple fixes this. A simple fix for now would be to create a custom playlist on your iOS device and exclude U2’s “Songs of Innocence” from it.